If you’re a dog lover, your dog means everything to you. When you have to leave him or her alone at home, it tugs at your heartstrings. Did you know that the first 15-minutes are the hardest for your dog? It gets a little better after that but not by much. It’s a fact that dogs hate being left home alone even more than that kid in the movie! So, what are you to do if you can’t be with your pooch 24/7? How can you lessen that anxiety that you are feeling all day long when you wonder if he or she is okay? Is there actually a way to know what your best furry friend is actually up to during your absence? Many dog owners ask those same questions. And, let’s face it, when dogs get lonely and bored, they often act out. Sometimes, that can mean leaving significant damage in their wake. Remember that new pair of shoes that weren’t new anymore after Fido got hold of them one lonely day? Yes, it’s things like that, things that can really show you how unhappy your pooch is when there is nobody there with him or her. What dog owners need is a device that keeps their beloved pets busy, keeps an eye on them, and even rewards them for good behavior. Well, you know, that’s what the Petcube Pet Treat Camera is and it actually works! 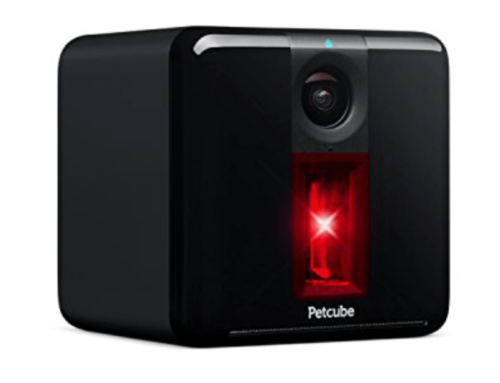 The Petcube Pet Treat Camera holds a larger amount of treats than other pet cameras. 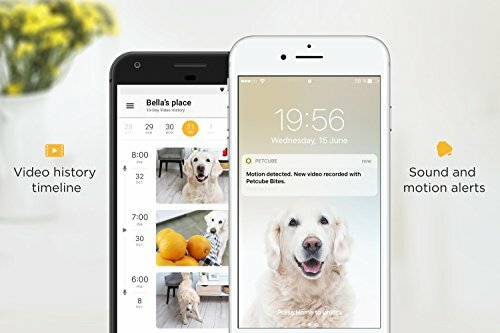 It provides the same resolution as the other cameras in this market and is successful in connecting you with your dog when you can’t be home. This device can be buggy and have connection problems. The Petcube Pet Treat Camera is perfect for loving pet parents who have to work outside of the home. It’s also for those who might have to leave their pet alone for trips to the store, social engagements, doctors’ appointments, etc. We all know how dogs hate being left alone and often suffer needlessly or turn to tearing things up around the house or other mischievous acts to soothe their broken hearts. Additionally, some dogs have health problems that require monitoring and their pet parents can trust Petcube to be the best option. It can be a lifesaver for them and also for their beloved pets. Let’s face it, nobody wants their pup to have a broken heart but that’s what they get every time their mom or dad walks out that door and doesn’t bring them along. 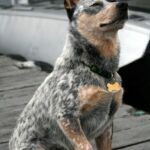 Pet parents obviously want to do everything that they can to remedy this problem but perhaps don’t know how to do that. A lot of pet parents were in the same boat until they discovered the Petcube Pet Treat Camera. The Petcube Pet Treat Camera is the perfect tool for users of all ages and walks of life. It’s not expensive or difficult to use so even senior pet parents can easily conquer the Petcube setup. 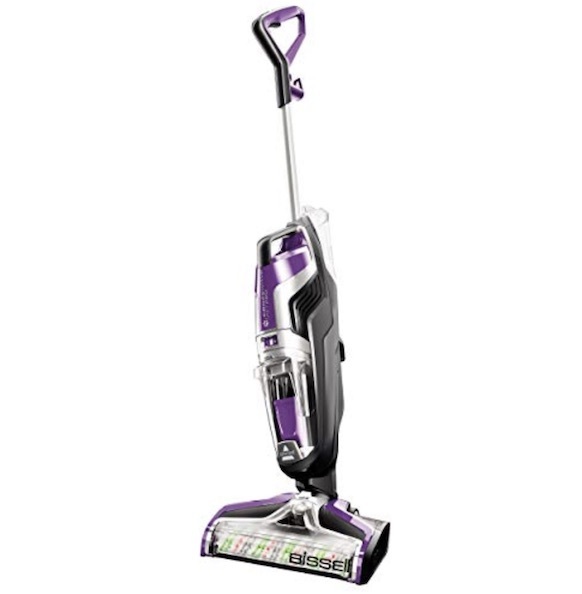 So, as you are starting to see, this product is a win-win for everybody. Pet parents don’t need to worry anymore and their dogs can have an easier time when they are left at home. 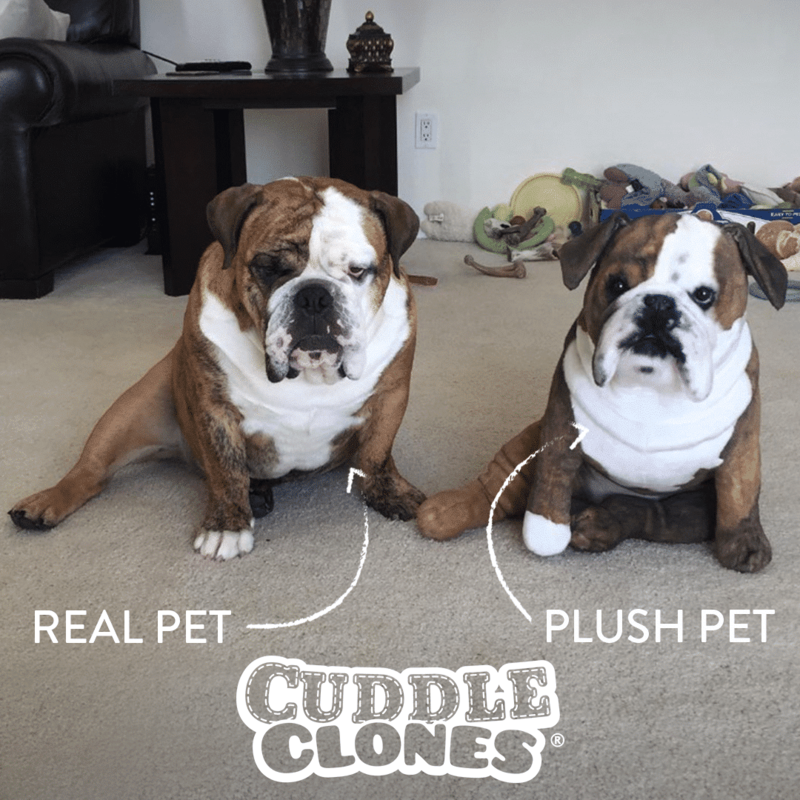 They feel like Mom or Dad is right there with them through the Petcube’s interactive features. 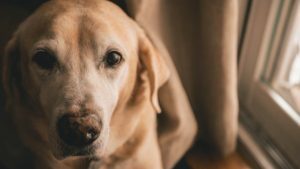 It’s easy for anyone to start monitoring, talking to, and basically interacting with their dog through the two-way audio and the handy video camera when not at home. And, folks who know about dogs know that an engaged pet is a satisfied pet. 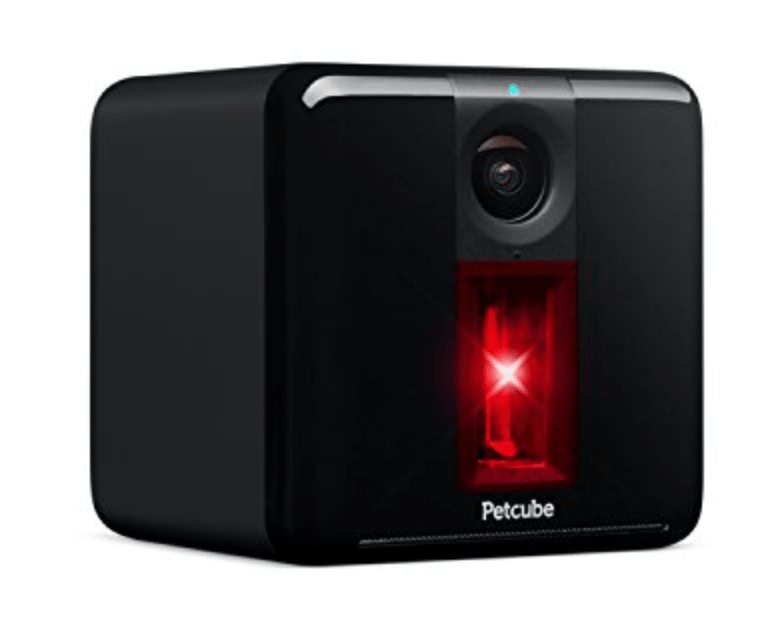 What better way to engage than with a Petcube interactive device? 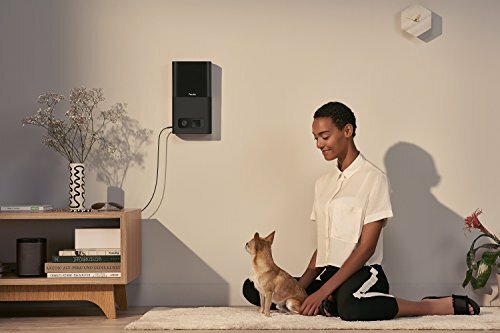 Petcube wants to bring about the creation of a world where pet parents and pets can enjoy meaningful connections with each other around the clock. It tosses dog treats up to six feet. The high-capacity two-pound container holds 100 treats. It automatically tosses treats at scheduled times. Video streams in 1080p HD. It takes videos with 138° wide angle view. It offers timeline history and cloud-based video recording. You can easily share both videos and pictures. Pet selfies can be automatically taken when your camera detects him or her in front of it. It can also let you see in the dark with its night vision, allowing you to see what your pet is up to 24/7. You can listen and talk to your dog from anywhere in the world, chatting with them like you’re right there in the same room. Petcube cameras offer an award-winning design and come in several colors allowing them to fit into any decor in any home. 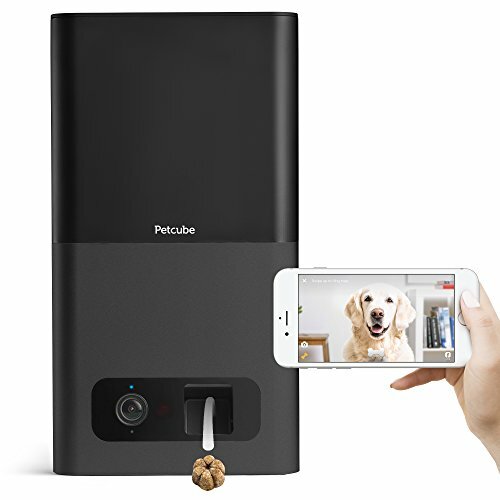 The Petcube Pet Treat camera dispenses treats that are perfectly safe for all dogs, large or small, young or old. They just need to be used responsibly according to the user manual. 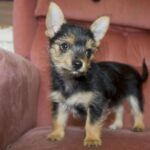 It is important, however, for pet parents to pay particular attention to how the device is constructed. 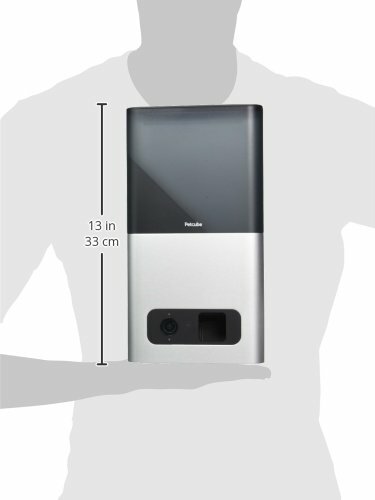 Petcube devices are always made of hard plastic and sturdy metal. Some other devices from other manufacturers are rather flimsy. 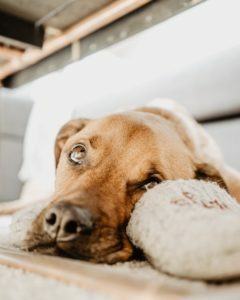 Ensuring that your pet treat camera is just as durable as it can possibly be is important so that you don’t have to be concerned about it getting opened up, knocked over, or even damaged by your pet. 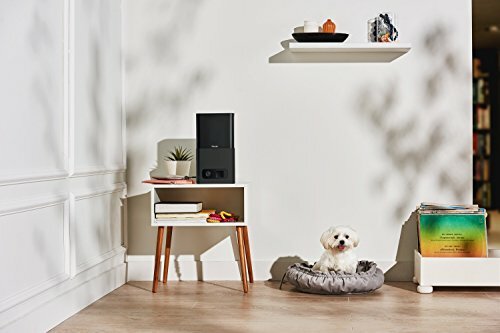 The set-up is easy through Bluetooth and a WiFi network connection in your home. It provides an easy and fun way to interact with your pet from wherever you may be. You can give your pet treats while you are away. There is a dedicated app to control your device, which allows you to share photos and videos through social media. The Petcube App lets you toss your pet’s treats at a distance that you choose and you can also set a schedule for automatic treat dispensing. 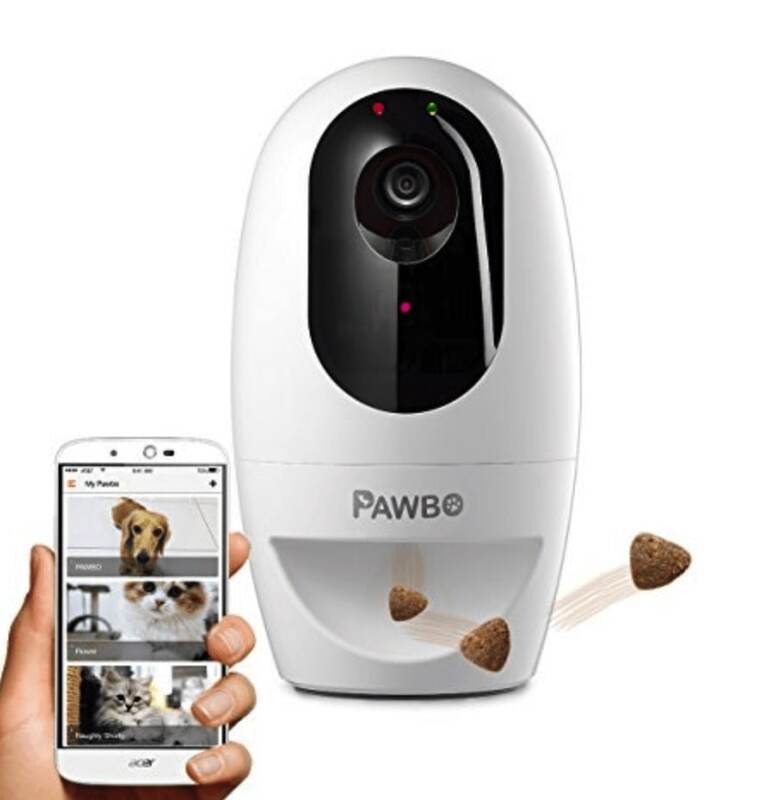 Your Petcube pet treat camera is compatible with a wide range of dry cat and dog treats. A supply of premium brand-name dog treats included. You also get free video storage that is cloud-based with your Petcube pet treat camera. Users mention some hardware problems. There might be difficulty connecting to WiFi. Petcube put the features that were the least-used on their main screen and features that were the most-used at least two to three pages away. Petcube Bites interfered with other devices on user’s networks. Both the hardware and the software can be buggy. 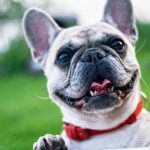 So, what are Petcube treat camera purchasers saying? Well, one common theme seems to be that it’s an amazing product. Users say that the device is really great for when you need to check on your pets and they also said that it can double as a security camera with its night vision and motion detector. Other users reported that they mounted the camera on their wall and that the process was extremely easy to do with the included hardware. Numerous users said that their camera was up and running in less than ten minutes! 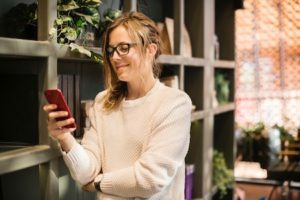 Some said they love the two-way audio while others said they really enjoy having the ability to share their pet pics with friends and family members. Several users commented about the packaging being nice as well as the start-up instructions being straightforward. One user was pleased that the treat camera only throws a few treats at one time. This means that even when using it several times a day, he doesn’t have to worry about his pups getting too many calories. He also said that he found the camera to be nice and clear, and appreciated the fact that it boots up quickly. And, last but not least, most of them said that you simply can’t beat the Petcube customer service! With such caring people at the helm, it’s no wonder that Petcube products are of such high quality. To begin, check the mounting and placement options. 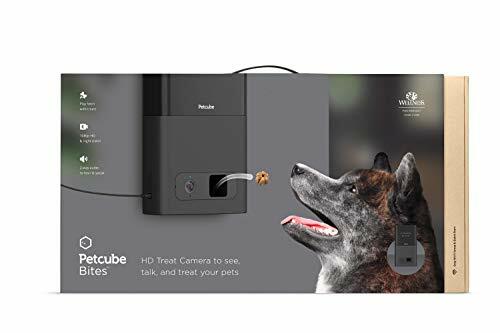 For a tabletop placement, Petcube Pet Treat Camera offers you a non-skid surface on its bottom. This is good because the device won’t be tipping over easily or moving around much. If you prefer to have it on the wall, it also comes with a handy, easy-to-install, wall-mount. Setting up the Petcube is easy with the free Petcube App. It is available for Android or iPhone user and is completely free. Be sure to look for the Petcube yellow light as per the Petcube manual. And, don’t forget to plug in the included Petcube power cord. 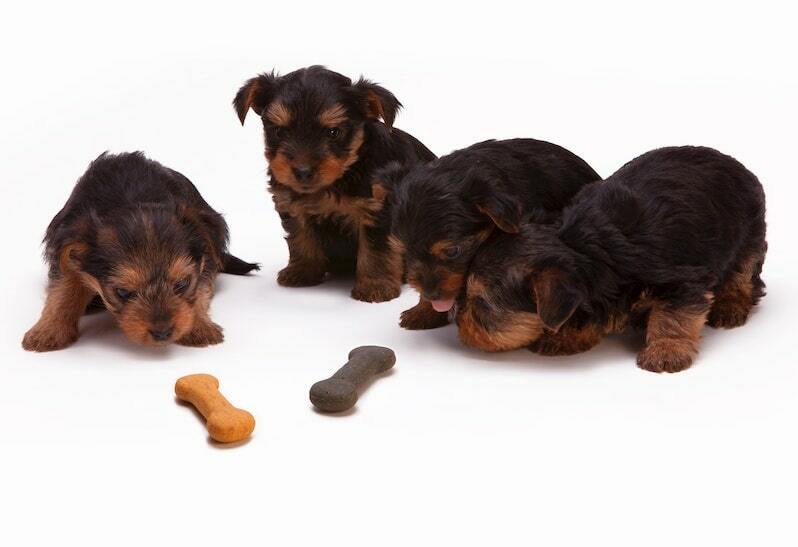 Your Petcube Pet Treat Camera is compatible with a wide range of dry dog treats. You can control the number of treats that are dispensed by adjusting the setting through the app. You also have multi-cam capability so you can connect up to six cameras to your Petcube account. This is great for keeping tabs on all of those important places in your home. Important Notes: Do not drop, shake, strike, or tumble your Petcube Pet Treat Camera. Make sure you do not scratch, stain, or damage its front panel. Avoid placing any objects on top of your Petcube Camera. Put your Petcube pet treat camera on flat surfaces only. 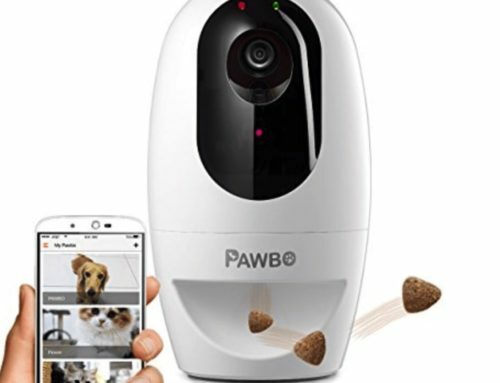 This competitor’s pet treat camera has a full HD WiFi camera and two-way audio. 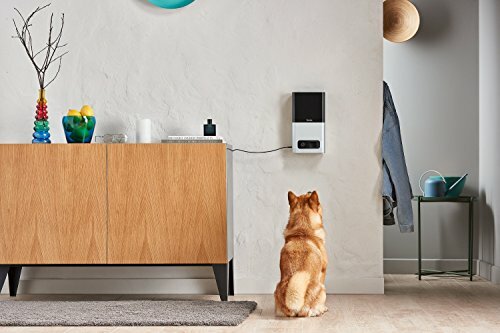 The Furbo is designed for dogs and it works with Amazon Alexa. Users can live stream video for the purpose of monitoring their pets using a 160º wide-angle viewer both night and day. Tossing treats to dogs via the included Furbo iOS/Android app. Users can fill this device with 100 of their pooch’s favorite treats for playing a fun game of catch. 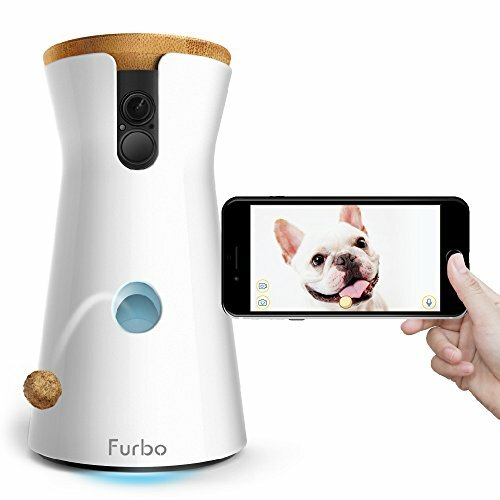 The Furbo also has two-way chat as well as a barking alert via push notifications sent to the pet parent’s smartphone when it has detected barking. Users can know at all times what’s happening at home so they can talk to their pets for calming them down using the app. 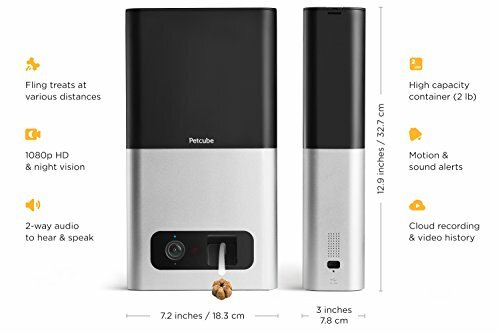 In general, the pricing on this item is comparable to the Petcube Pet Treat Camera but keep your eye out online for special lower-priced Petcube deals. 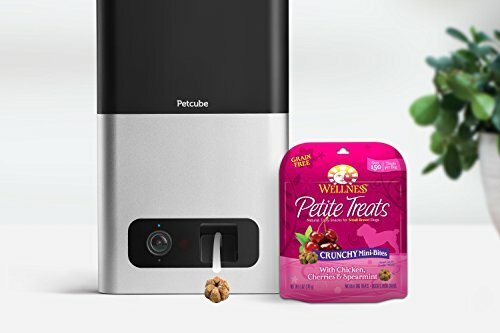 This WiFi pet camera and treat dispenser provides an easy and fun way for connecting with and treating the family pets from virtually anywhere. Dispense any pet’s favorite treats using the Petzitreat launcher to get big smiles from your furbaby. Pet parents can say “hello” to their pets via high-quality audio. The device’s dedicated Android and iOS app controls this device, allowing the content to be shared. Capturing candid pet photos for saving or sharing is easy. 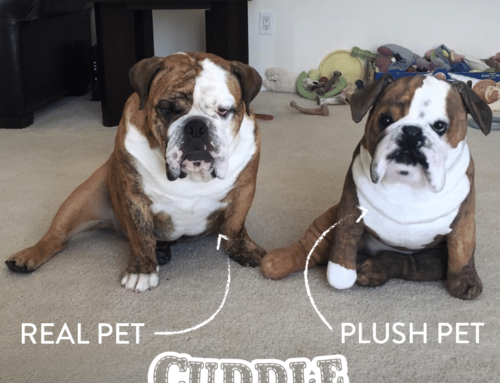 With just a tap, users can see, snap, speak, and/or treat their pets. 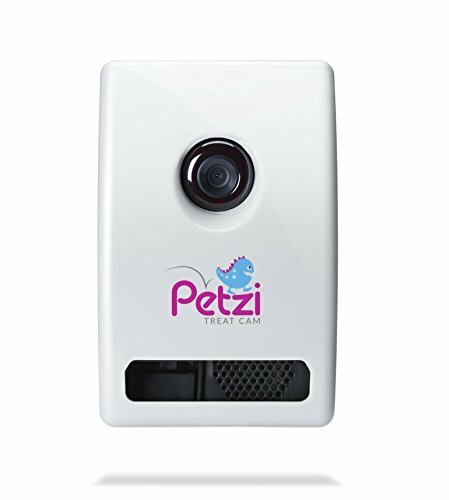 The Petzi Treat Cam is a bit lower in price than the Furbo and the Petcube Pet Treat Camera, however, the quality of construction also seems to be lower. 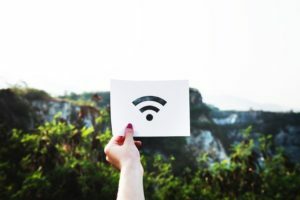 Several users complained of unclear troubleshooting instructions and difficulty in connecting to WiFi. Amazon Dash Replenishment Service (DRS) can help by giving Amazon Petcube users one less thing to worry about. When pet treat supplies start running low, Amazon automatically reorders them, and ship them right to your home. 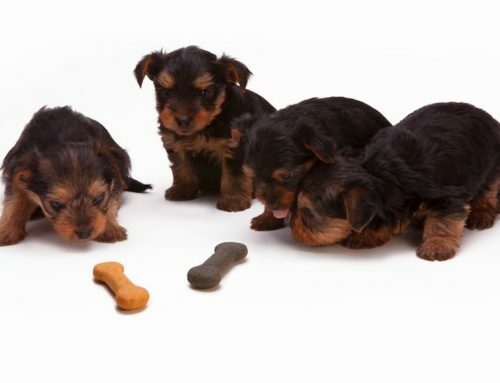 You can easily handle the management of treat reordering using your Amazon account or the Petcube App. Q: Is this the same as the Petcube Play? A: No. 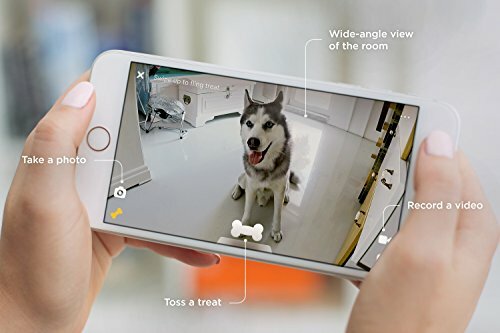 ThePetcube Play is an indoor pet camera for your home for checking in on your dog both quickly and easily using your smartphone. It’s a perfect choice if you want a camera but no treat dispenses. You get increased peace of mind when you know that your home and your pet are both secure. You can also use the Petcube Play tripod with it. Q: Where should I place my pet camera? A: It will actually look beautiful in any room. All you have to do is decide what will be the most convenient place in your home for setting it, like on a flat surface such as a shelf or a table. Or, you can opt for mounting it on a wall with the drywall-anchor-screws that are included in your mounting kit. Q: How large is the treat dispenser? A: It will hold up to two pounds of treats that are up to one-inch in size. We actually research every single product and it is reviewed in person for the purpose of determining which one is the very best. This applies to dog food, toys, gadgets, and everything else that we review. 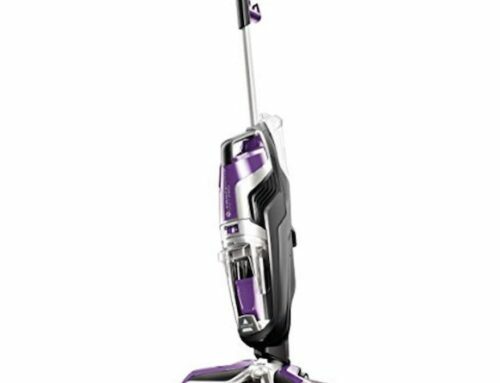 We also compare each and every product to similar products from other manufacturers that are currently on the market, comparing all of the features so we can make recommendations on how they can improve on them. An in-depth product analysis is performed, including analyzing all of the online comments and reviews to find the absolute best product to recommend to you, the loving dog-owner. Any lower-performing pet products are then filtered out to provide only the options that we would actually buy ourselves.